You link your HPE Support Center profile to a support agreement, packaged support, or warranty. 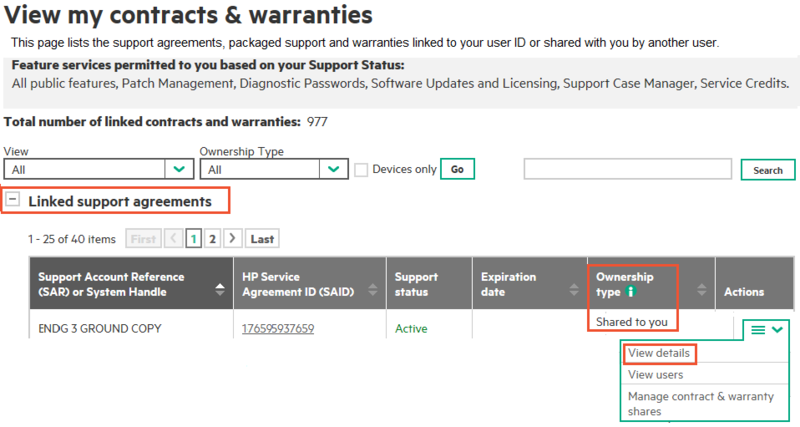 Another user has linked their HPE Support Center profile to a support agreement, packaged support, or warranty, and has created a contract and warranty share that includes you as a member. You connect remote support devices to Insight Online and the contracts or warranties for those devices are automatically linked for you. Note: Contracts and warranties are managed through the HPE Support Agreement Manager website. To reach the site, click My IT Environment > Contracts & warranties > HPE Support Agreement Manager. You can link three types of contracts and warranties. Expand the section below section for the type of contract or warranty you want to link. 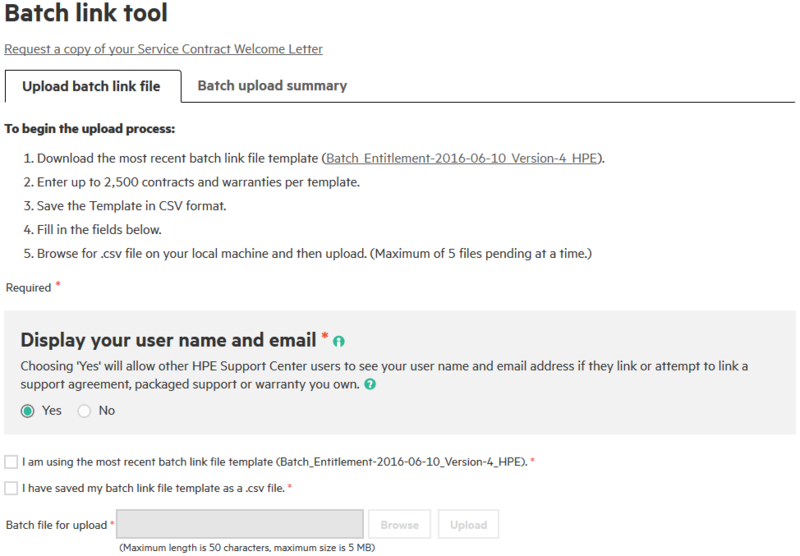 If you have a large number of contracts and warranties to link, HPE recommends you use the Batch link tool. On the Electronic Support Contract Assistant website. In the customer cover letter that describes the contract or warranty. If you do not have your contract IDs, click the Request a copy of your Service Contract Welcome Letter link at the top of the page. Option 1: main menu > My contracts and warranties, then click Link support agreements. Option 2: My IT Environment > Contracts & warranties > Link support agreements. Option 3: On the HPE Support Center homepage, click Contracts and Warranties, then click Link support agreements. Choose whether to display your email. Select "Yes" to share this information, or "No" to keep it private. Choosing "Yes" simplifies the management of your entitled services by allowing other users to see your name and email address if they link or attempt to link a contract or warranty you own. For details, see Display your user name and email. Enter your Service Agreement ID (SAID). Enter your Support Account Reference (SAR). Choose an ownership type. If you link a contract or warranty yourself, you are the initial owner. As owner you decide the ownership type: single or multiple. This choice affects the ability of other users to link to the contract or warranty. Single—Use this mode to be the only user who can link to the entitlement with full privileges and control. You can still share it to one or more other users, so they receive some or all the privileges. Multiple—Use this mode when you are in an organization where support for contracts is done by a group. In this mode other users can link to the entitlement with full privileges; all are equal owners, therefore, creating shares is unnecessary. Repeat steps 3 through 5 for all of your support agreements. Click Add more support agreements to add up to 20 links. If you need to add more than 20 links, consider using the Batch link tool. Change the ownership type for that contract or warranty from single to multiple. Add you to a user group associated with a share containing that contract or warranty. Add you to a user group associated with a device group that includes a device covered by that contract or warranty. Note these are the product number(s) of the products covered by the packaged support. Product location This is the country where the product was purchased. Option 1: main menu > My contracts and warranties, then click Link packaged support. Option 2: My IT Environment > Contracts & warranties > Link packaged support. Option 3: On the HPE Support Center homepage, click Contracts and Warranties, then click Link packaged support. Enter your Packaged support ID (SAID). Enter an optional product nickname. Repeat steps 3 through 7 for all of your packaged support. Click Add more support agreements to add up to 20 links. If you need to add more than 20 links, consider using the Batch link tool. Option 1: main menu > My contracts and warranties, then click Link warranties. Option 2: My IT Environment > Contracts & warranties > Link warranties. Option 3: On the HPE Support Center homepage, click Contracts and Warranties, then click Link warranties. Enter your Product serial number. Repeat steps 3 through 7 for all of your warranties. Click Add more support agreements to add up to 20 links. If you need to add more than 20 links, consider using the Batch link tool. The Batch link tool allows you to link up to 12500 contracts and warranties to your profile at a time. You can upload five files containing 2500 contracts each. If you have more than 12500, you can resubmit as many times as you need to, until all of your contracts and warranties are linked to your account. Browse to My IT Environment > Contracts & warranties > Batch link tool. Download the latest Microsoft Excel template file from the link in Step 1. The format of the template name is "name-date_version", where the date is represented as YYYY-MM-DD. Read the detailed instructions in the Readme sheet of the template. Enter information, one contract or warranty per line, according to the titles at the top of each column. Enter a maximum of 2500 lines, for each instance of the template you create. Note that some of the fields are optional. For details, see CSV file field values. If you do not have your contract IDs, click the Request a copy of your Service Contract Welcome Letter link at the top of the Batch link tool page. Do a "Save as", to comma-separated value (CSV) format. (Select CSV (Comma delimited) (*.csv) option only from "Save as type" in Excel.) The result is a plain text file containing the entries from the spreadsheet, with each field on each line separated by a comma. Optionally, update whether to display your email. Select "Yes" to share this information, or "No" to keep it private. Check the boxes to verify that you have selected the most recent template, and that you have a CSV file. Browse to the CSV file on your local computer, then click Upload. Completed with errors. See the report file for details. Invalid file format. The file was not recognized as a valid CSV file. File exceeds limit. The file was longer than 2500 lines or greater than 5 MB. Pending. Files that have been received and have not completed processing. A maximum of two uploads can be pending. System error. The file itself may be fine. Try uploading again later. The CSV field values are the same as the columns in the Excel spreadsheet. The CSV file requires different fields for different contract and warranty types, called "Obligation type" in the Excel spreadsheet. See the table below for the required fields for each obligation type. 1 The product number of the product covered by the Packaged support or by the warranty. 2 You can add a nickname for packaged support or warranty. Service agreements have predefined nicknames, added at the time of signing the contract. Normally you export from the downloaded template and "save as", and do not need to edit or even look at the CSV file. There may be cases however, such as if an invalid file format error occurs and you suspect that the file may be corrupt, where it is useful to inspect the file. Each line should contain at least six commas. Additional commas at the end of the line, which may occur if any text, even a space, was in the seventh column of the template file you exported from, are ignored. A support agreement was inactive or was in single ownership mode. A warranty was inactive or was migrated to uplifted packaged support. Packaged support was inactive, was in single ownership mode, or was uplifted to a Support Agreement. You should address these cases individually, by reactivating or by changing the ownership mode to multiple. Once you have done so you can then resubmit a file containing these entries for batch processing, or depending on their number, simply link them interactively. A child device group you create. A device group of which you are an administrator. However, you can update the derived contract and warranty share from Manage device groups in the device group area, by selecting Run contract and warranty update in the Actions drop-down list of the corresponding device group. See Run contract and warranty update for details. You can share contracts and warranties that are linked to your profile by creating a contract and warranty share or a child device group. You are linked to the contract through a contract and warranty share created by an owner. Privileges are limited by the roles assigned to the user group you are in, that the owner associated with the share. You can also be linked to a contract indirectly through a device group that has a.) an associated user group that includes you as a member, and b.) contains a device covered by the contract or warranty. If a contract is shared with you, either directly through a share or indirectly through a device group, you can access the features available in the contract, as long as access to those features is enabled for the user group you are in. See Assign roles to user groups for details. Browse to My IT Environment > Contracts & warranties > Manage contract & warranty shares, then click Create new share. Name the share and add contracts and warranties. Associate user groups to the share. Assign roles to the user groups. One of the user groups you added in Step 3 must be assigned the role of share administrator, because at least one user group must have that role. Select the administrator check box. You can change this later, as long as one user group has administrator role. To add user groups with the role of member, you do not need to check any boxes, since the member role is the default. The features allowed by the contracts and warranties associated with the devices in the device group. The roles you enabled when you created the device group. See Assign roles to user groups for details. See Create a child device group for the procedure. You have purchased a new contract that applies to at least one of your devices, and you have linked that contract to your profile. Another user has shared one or more contracts with you, that apply to at least one of your devices. 1.) Another user has changed the ownership type of a contract that applies to at least one of your devices from single to multiple, allowing you to link that contract to your profile. 2.) You have then linked that contract to your profile. The result of running this update is that contracts that you have linked will be visible from the details page of both the device group and of the individual device(s) covered by the contract. You can simplify the management of your contracts and warranties by allowing other users to see your user name and email address. Option 1: main menu > My contracts and warranties. Option 2: My IT Environment > Contracts & warranties. 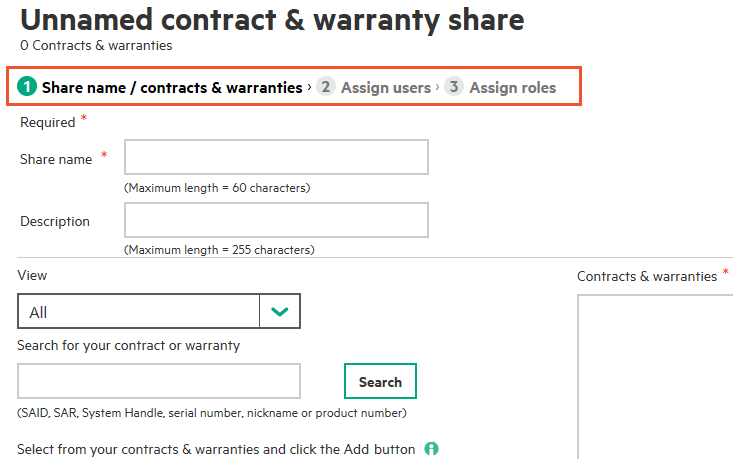 Option 3: On the HPE Support Center homepage, click Contracts and Warranties. Select "Yes" to share this information, or "No" to keep it private. Choosing "Yes" simplifies the management of your entitled services by allowing other users to see your profile and email address if they link or attempt to link a contract or warranty you own. You can view and change this setting at any time. Regardless of the selection you make, if you are the single owner of a contract or warranty and you create a share including it, the users in the associated user group will be able to see your information as well as the information of the other users in that user group. In other words visibility among users within a share takes precedence over this setting. You can transfer ownership of your linked contracts and warranties to another registered HPE Support Center user. This action is only available to owners, and only to contracts and warranties that were not derived. This actions is not available to you if the contract or warranty was shared with you. Single You transfer ownership to a different user with a valid profile, by entering that user's email address. Your account is unlinked from the contract or warranty. The contract or warranty will be removed from any share you own. Multiple You replace your link to the contract or warranty with a link to another user's account. Links to the contract or warranty from other users are not affected. Browse to My IT Environment > Contracts & warranties > Transfer ownership. Specify the new owner by entering their email address or by selecting it from the list. Click Add. Select the contracts and warranties you want to transfer. If you want to remove the remove the association of the contract or warranty with your profile you can unlink the contract or warranty. If a contract or warranty you are linked to with single ownership is also part of a share, consider transferring ownership before unlinking it from your account. If you do not, the share will be removed as well, and those users will lose their access to the services provided by that contract or warranty. Browse to Contracts & Warranties: My IT Environment > Contracts & warranties > Unlink contracts & warranties. Unlink single or multiple items at one time by checking the box below the "Unlink" column.